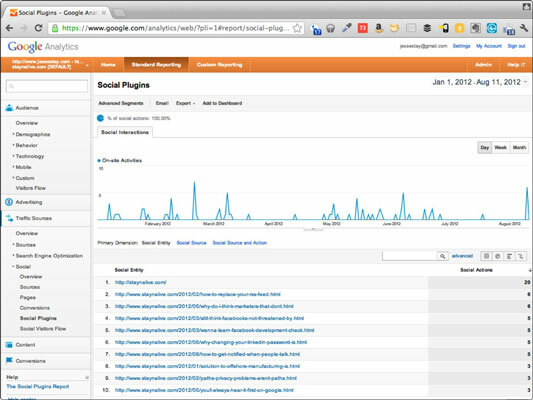 Google Analytics will allow web marketers to track the +1s you have on your website. This is helpful because you can see which audiences like particular content. Then, you can direct your content to particular audiences. Google stores this under a section called Social Plugins. The idea here is to offer a place where you can take a closer look at the results you’re getting from social plugins (such as Like buttons, +1 buttons, and other such plugins that indicate visitors’ approval) on your site. Presently the Social Plugins feature only supports the +1 button. Open your site in Google Analytics. Your Google Analytics site appears. If there’s a specific time period you want to track, you can specify it here on the landing page, but you can set or change it on any page in Google Analytics. The Social Plugins page shows you a graph of all the times someone clicked a +1 button on your website over the time period you specified. Below that graph, you can see which pages on your website have attracted the most +1s. Presently, checking out the effect of social plugins on website traffic really is that simple. So far, this section of Google Analytics only supports +1s — but it’s expected that Google will soon support the tracking of Like buttons and such on your website, all from one interface. The Social Plugins section seems to be a bit buggy. It doesn’t always seem to report all the clicks of +1 buttons.